The Fusion line of ammunition features a great cartridge known for its long-range terminal performance on game – and it uses the AccuBond bullet. Another great attribute of this ammo is that these are excellent rounds to hone your skill during long-range practice sessions. The jacketing allows them to be used on most ranges and public lands. White Polymer Tip: What good is a polymer tip anyway? Well, imagine your box of hollow points with a nice little piece you could slip into the end that would give them superb aerodynamics. That’s what this tip is for. It allows the bullet to fly smooth, chamber flawlessly and prevent tip damage during recoil. The Nosler AccuBond line of bullets first hit the scene just a couple years back. 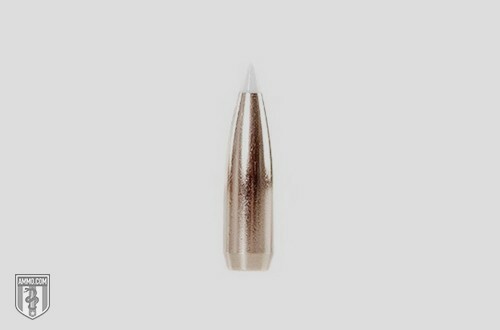 This is a jacketed, lead core soft point bullet created with proprietary technology, specifically for hunting various game. The AccuBond was created to take down deer, moose and African game – with an amazing amount of stopping power, in hopes of ensuring single-shot kills. This particular bullet has a great ballistic coefficient among reloaders and has high praise on reloading forums across the internet. Tapered Copper-Alloy Jacket: The copper jacketing on these bullets is designed for uniform expansion, and the tapering ensures you’re going to get a very similar result with each bullet fired. The thicker base allows maximum weight retention. Lead-Alloy Core: The way the core of these bullets works is to give you as close to perfect expansion as possible. You should see the same mushroom behavior time and time again. Boat Tail: Boat tail bullets are more aerodynamic and you can easily see the difference at extreme ranges due to the excellent ballistic coefficient. The one thing every site agrees on is that the weight retention of these bullets is second to none. There are some similar ammo lines out there from other manufacturers, but these have very high praise. This line is for the largest game out there and performs beautifully in that use. There’s a distinct separate line by Nosler called the AccuBond Long Range, if you’re looking for even more accuracy at extreme distances. For some thinner-skinned animals like smaller deer and antelope, you’re more likely to have over-penetration. Nosler recommends using their Ballistic Tip line, if you find this to be the case. Shot placement and range is going to be a huge factor here, so use what you find more suitable for what you’re hunting. This bullet seems to be well received on most hunting and sniping forums. It’s highly accurate, powerful and gets positive reviews from reloaders. The main concern people have is the over-penetration compared to the Ballistic Tip ammunition. If you’re just making the switch from a normal bullet to something more premium like the AccuBond, take time on the range and put rounds into various target types so you know what to expect in the field.